My family and I are just back from a trip to Pennsylvania, where I knit quite a bit, we visited with Day's (that'd be my husband) family, and visited an eye specialist in Philadelphia, at the Scheie Eye Institute Center for Hereditary Retinal Degenerations. Our family and friends have wanted more details about this doctor visit, and now that we have filled in the closest family, I thought I would provide some information here for those who are interested. If you aren't interested in that, skip this post and know that we'll get back to the yarny things soon. A little backstory: Day was born with a hereditary condition called Retinitis Pigmentosa (RP). His RP was diagnosed when he was about 14 years old, when he began to have vision trouble in low light situations. At the time of his diagnosis, he was told that he had X-Linked RP, and often the progression of this disease leads to complete blindness by age 40. Over the years, Day has participated in several scientific studies that have aimed to slow the progression of the disease. We believe that this research and his participation in these studies has led to a slower progression, where at nearly 45, he still has useful eye sight, though some situations and environments are particularly challenging. Several years ago, Day discovered that researchers were working on gene therapies for specific genetic defects related to RP, and found that that most common form of X-linked RP was related to a gene called RPGR (or RP3). Day researched and found the Carver Laboratory who could test his blood and determine what gene was causing his RP. The results of this testing were promising, because it was confirmed that he had a common form (RPGR with the ORF15 exon). We both felt that this was good news, because it would seem that the most common forms of the disease would be the focus of the first treatments. While waiting for that scheduling call, Day followed the studies that precede a human trial for a new therapy, and knew that they were in their second animal test, and that the results coming from a study on dogs were encouraging. Day also researched the necessary steps to getting to a human trial, and discovered that two animal models needed to be completed, funding for future studies needed to be secured, safety data needed to be collected and protocols needed to be written, then there would be a meeting with the FDA to determine if approval could be granted. So, we were called to schedule an appointment in February, and we made plans to go to Philadelphia as soon as we could. We were told to plan to be at the facility from 8:30 AM until 6:00PM, so we prepared for a long day. We expected that the testing would be similar to the testing he had done at previous research studies: visual field testing, testing of night vision, color vision, and an ERG. The tests involve heavy dilation of the eyes, so someone needed to stay with the him, helping with getting around, gathering food and whatever else may help, and that was my role in the day. The process began with determining Day's current eyeglass prescription, and other activities typical of a standard Ophthalmology visit. Then we went upstairs to the research area, and they tested color vision, and Day began clicking buttons to let them know what he could see. Dr. Jacobson and his crew had discussed the characteristics of an ideal study patient, and had determined that, at least at this point, their ideal candidate would have "large swaths of peripheral vision" that could be treated with the therapy. At some point in the day, it was determined that Day had these large swaths of peripheral vision, so Dr. Jacobson looked at the preliminary tests and altered the tests that were planned for Day to include further testing of his visual field. This was done to ensure that he was a good candidate for future trials, and to minimize our need to return to Philadelphia for more testing. The Perimeter where Day's vision was tested for about 9 hours. At the end of this testing (about 9:30 PM), the test administrators Rebecca and David went and met with Dr. Jacobson, and discussed what they had found. Then Dr. Jacobson came and met with Day, looked at his eyes, and then brought me into the room. Together, we talked about how Day could best use the vision that he still has, what nutrients and supplements may be useful to strengthen his eyes, and finally, the fact that Day was, at this point, a prime candidate for the research they are planning. Dr. Jacobson described himself and Dr. Cideciyan as people who don't get extremely excited by the research they see very often, and he said they were very hopeful and encouraged by the canine studies that are occurring now. At about 11:00PM, we finished meeting with Dr. Jacobson, left the facility, and drove back to Allentown to meet back up with Ethan who had stayed with the family there. Now that we are back home, we are sort of in a waiting game. Dr. Jacobson had some advice for how Day could make the most of his vision, so we will be trying out his ideas. We are working on adding Lutien to Day's diet (actually we were already doing most of that anyway, so this is just adding a supplement), and continuing his high doses of Vitamin A Palmitate, and we are waiting for a call that says that the time has come for the treatment. We were told to expect to hear from them when they are ready to begin a trial, and thanks to Day's dedication to keeping up with the research, we should be able to see the progress as time passes. When that call comes, Day will have a choice to make of whether to take the treatment or not. The treatment will be injecting the gene therapy into the sections of his retina where the vision in those peripheral ranges was strongest. It will be intended to stop the progression of the disease in those areas. At this point, Dr. Jacobson is not planning to treat the central vision areas, for complicated reasons, but that may become an option in the future, or something else could help with that down the road. There is obviously some risk with a clinical trial, so the doctors are trying to balance risk with opportunity to provide the most useful amount of vision for the longest period of time. Despite the fact that it was a very long day, it was extremely encouraging. The faculty and staff of the Center for Hereditary Retinal Degenerations were extremely kind, considerate, and helpful, not to mention dedicated to helping people facing blindness. Meeting with the head of the research program until 11:00 at night, researchers who continuously offered to help us in any way they could throughout the day and evening, getting the news we had hoped for, and finding that an answer was potentially close made this long day feel very good. I know this post has become rather lengthy, but I was so impressed by the people I met at the Scheie Eye Institute that I feel like I have to say more. While we were waiting, we met a family who has a son with a different condition. His vision is at least as diminished as Day's vision, except that he is 16, not 44. I didn't ask to share their story, so I won't say more than I've already said, but if you remember the things your were considering at 16-17 years old, and imagine making those decisions with blindness factored in, you can begin to understand what they are facing. Add to that the fact that they were told that they are at least 5 years from a treatment, and you'll begin to understand how incredibly fortunate our family feels. I have been hoping for several years now that Ethan, my almost seven year old son, would decide that he would want to learn to knit, and the day finally came! Despite my hopes and wishes, I decided to just keep knitting in front of him, supply him with plenty of beautifully knit items, and wait until he approached me. Every once in a while, I would mention that if a child can read, they can probably also learn to knit, and he has considered himself an excellent reader for about a year now (and he is an excellent reader). I was hoping that the thought of knitting was rattling around in his head, just waiting for an opportunity. He took to it like a champ. I heard him say things like, "This knitting is really fun!" He also declared that he "wouldn't have to be bored again." I mentioned that when we were home, I would get him out some more appropriate (solid, light color and slightly heavier weight) yarn, and his own needles from my stash, so that he could practice some more. He didn't think that would work. He actually decided that a proper knitter needed to have their own tools, fresh from an LYS. I pondered that thought, and decided that he was probably right. New needles and yarn you chose yourself would probably make him a happier knitter, and happier knitters keep knitting, so, off we go to the yarn shop. Score another one for Team Knit, and another mighty participant in the Kansas City Knitting Revolution! Color Infusion is a reversible cowl, worked in three colors, using Fair Isle techniques. 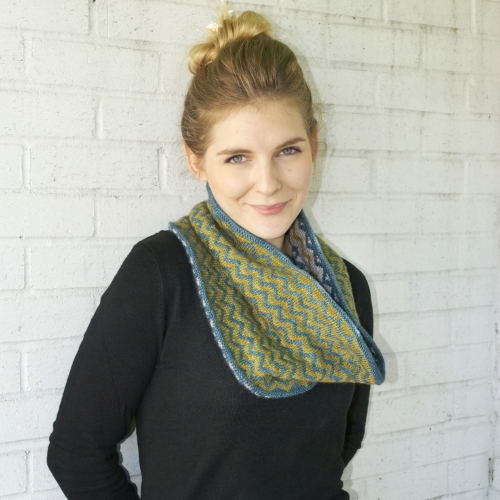 The cowl is a great project for knitters who are looking to learn stranded, two-color knitting, because the pattern is very repetitive and predictable, the floats are short, and the striping nature of the design makes it feel like the knitting is quick. In addition, because the design is made in a long tube, folded in half, and seamed, the floats are hidden on the inside, so anything messy will never show. There are a couple of questions that I am often asked about the pattern, so I'll take a moment to answer those here. First, many knitters wonder about the choice to finish the cowl with a whip stitch, rather than beginning with a provisional cast on and closing with a grafted (Kitchener) seam. I made this choice for two reasons: first, because with the seam falling right at a fold line, the need for an invisible seam was minimal, and second, because this pattern was intended to be for less experienced knitters, so eliminating this more challenging finishing technique and the more advanced cast-on made it more appealing to my intended audience. Of course, if these are skills that you already have, it is certainly something that can be changed. Second, many people wonder if this is double knitting. While something very similar could be created with double knitting, this is a tube that is folded in the middle and the cast on and bind off edges are seamed together. 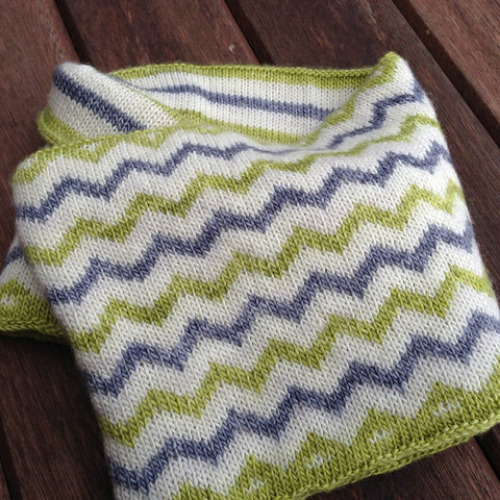 Knitters who have double knitting skills could adapt the pattern to create a double knit reversible cowl, but instructions for that technique aren't included in the pattern. Taking a look at the projects on Ravelry, there are many great cowls, with tons of fun and interesting color combinations. There are variations on the pattern, and ideas for making it your own. Below, I will feature a few projects that stood out to me. Photo Copyright NatKnits, used with permission. Here Natalie shows off a great pattern feature: a blank chart that you can color with your chosen colors. The pattern has a chart in the colors shown on the pattern photos, which also prints in greyscale to make it easier to read, but a blank chart is included to allow the knitter to really customize the pattern to meet their needs. I know that I when working with color charts, I really struggle if the colors on the chart don't match, especially if I have switched out a lighter shade for a darker one, so this option really works well for me. Natalie worked her cowl in The Plucky Knitter Bello, which is a Merino wool and cashmere blend. This pattern was originally released as part of a Plucky Knitter kit, and I really cannot say enough wonderful things about their colors, yarn bases, and the company in general. I'm sure Natalie's cowl is as cozy to wear as it is beautiful, with this yarn. Photo Copyright JudyMac21, used with permission. Judy worked her Color Infusion cowl in Madelinetosh Tosh Merino Light, and made a simple modification that I really like. 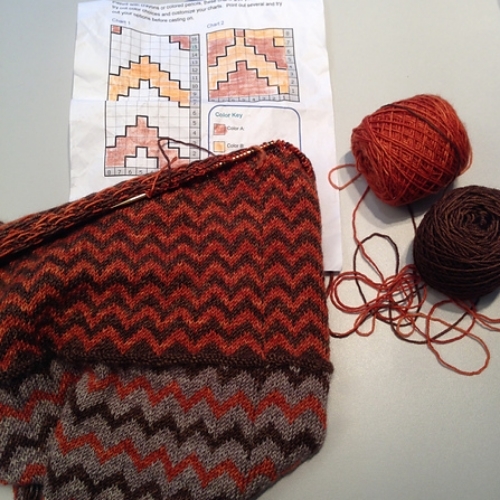 Instead of working the second side of her cowl in a two color chevron pattern, Judy knit in three color stripes. I think it makes a big difference in the look of the cowl, making the side that is on the inside more similar to the outside. The other advantage to this change is that it uses each color more evenly. The main color is used a little more than the contrast colors since the main color stripes are a bit wider than those in the contrast colors. This means that any leftovers can be coordinated to make another small item, like perhaps a pair of mitts, or a striped hat. Photo Copyright Butterflybrain, used with permission. Maria (Butterflybrain on Ravelry) knit her Color Infusion is a color palette that is a little bit different than what I would normally envision. When choosing colors, I often do a neutral, paired with two contrast colors, but this is a pairing of three blues, in light, medium and dark shades. I think the look is stunning, and I'm pretty sure that Maria agrees, since she said that she hasn't stopped wearing hers since it was finished blocking. I think this color combination was a kit that The Plucky Knitter envisioned, and I am also fairly sure that it is the one I bought. I haven't cast on for mine, but now that I have seen Maria's I am more and more tempted each day. Maria made another change to the pattern, and I think it is really a smart one. She worked the garter stitch turning and seaming rows in a needle that is one size smaller than that used for the main part of the cowl. Many knitters find that their tension is tighter in Fair Isle knitting than in one color work, and this change will make the piece not flare out at the turning ridges, as some knitters have experienced. If this in depth look at Color Infusion has convinced you that this cowl is your next project, clicking the Buy Now button will take you to Ravelry and get this into your library. I really enjoy creative time in the kitchen. I am a cook who cannot handle preparing the same meals again and again. If I can play with ingredients, combine spices in a different way, or find a really great fresh ingredient, I am inspired, and I have a lot of fun elevating that ingredient to something great, interesting and tasty. This salad came about as I tried to figure out a salad that would go with enchiladas. All of the restaurants we frequent make pretty boring salads to accompany tex-med style cuisine: lots of iceberg lettuce, chopped tomatoes, and ranch dressing. So, I went to the grocery store for inspiration, and found a couple of ripe mangoes, even though they weren't in season. 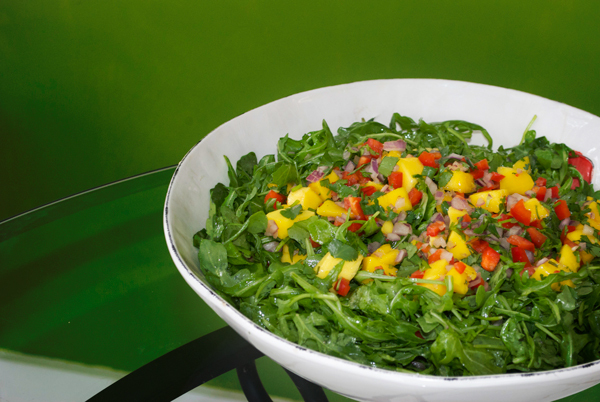 We really like arugula based salads, and it really pairs well with a sweet fruit topping. So, arugula went into the cart, along with my mangoes, then I used pico de gallo as inspiration for the rest of the salsa. Red peppers, red onion and cilantro were added to the cart, and I was off to put the salad together. This salad is fantastic, because the salsa can be used on its own as a nice accompaniment to chicken tacos, or fajitas. The salsa can be made ahead of time, and then added to the dressed greens closer to serving time, saving you time if you are entertaining, or taking the dish to an event. Begin by finely chopping the onion, red bell pepper, and cilantro. Cut the mango into chunks, removing the peel and seed. The mango chunks should be about 1/2 inch square, but size isn't crucial. In a small bowl, add in the chopped cilantro, red onion, mango, and red pepper. Toss to combine, and set aside, or cover and refrigerate. In a large bowl, add the arugula, salt and olive oil. Toss to dress the salad. Add the mango salsa to the top of the salad greens and toss to combine. The weather has finally made a switch from winter to spring in Kansas City, and I couldn't be more pleased. Knitting time has been transitioned to time spent walking, going to the park, and generally enjoying the sunshine. 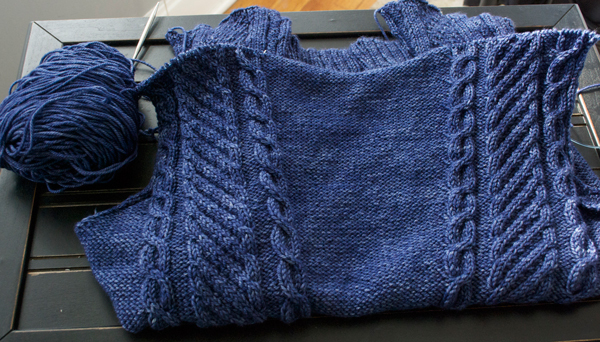 I did complete my navy blue sweater this morning, and it is blocking now. There should be photos later this week, but I would like to focus a bit on knitting and World War I. It seems a strange thing for me to be so interested in, but interested I am, so I will tell you what I learned. I'm not a history expert, so I've worked hard to ensure that what I present is error free, but if you spot an error, please let me know. Early in the week, I received a copy of Armenian Knitting. (That link takes you to Schoolhouse Press. Just scroll down until you find this title.) I have been interested in this technique for a while, since I love big motifs, and color, but I am not a big fan of intarsia. With this technique, I could get the look I was hoping for, without all the ends, and I needed to know more. In looking through the book, I learned that much of the Armenian knitting tradition had been lost during the Armenian genocide which began in April of 1915. Survivors of the genocide fled to France, using their knitting and needlework skills to support themselves. The most notable design using the Armenian Knitting technique is the Bowknot Sweater designed by Elsa Schiaparelli. Schiaparelli's early designs were knit by an Armenian woman, named Aroosiag Mikaelian, thus Schiaparelli said that her designs were in the Armenian tradition. You may not know that Kansas City is the location of the only World War I museum and memorial in the United States. This year, they are hosting a program called Mrs. Wilson's Knitting Circle, which takes a look at the relationship between knitting and World War I, with the goal of having a knitting circle like those that took place during World War I.
I didn't hear about this in time to make it to the first meeting, but when Kourtney from the 20's and 30's KC Knitting Group mentioned it, I was definitely interested. So, Kourtney, Melissa and I (along with Ethan) met up there, along with about 80 other knitters from the area. The knitting circle meet underneath the museum, in a research library, near the base structure of the Liberty Memorial statue. From the room, you can see the bedrock at the base of the statue, and a garden of poppies. The program on Saturday was focused on the music of the era, beginning with pacifist songs that supported the position that the US was not in the war. As the nation changed their position on the war, the lyrics were re-written to be more supportive of the war effort. As troops deployed, songs changed to being uplifting for soldiers and encouraging for those left behind. The pacifist songs had titles like 'I Didn't Raise My Boy to Be a Soldier', and served to draw people to the pacifist movement. Amongst those drawn to the pacifist movement were the suffragists, because the movement had political sway. As early as August 1915, however, news of the Armenian genocide was reaching the United States and Europe, and the popular opinion was beginning to change toward the United States becoming involved in the war effort. The overall sentiment of the population was that this wasn't our fight, but Germany began to fear that this genocide was something that would result in other European nations and the United States joining forces against them. Though it wasn't until a specific plot and attack against the United States in April 1917, that the United States joined the war against Germany. As the United States joined the war effort, music shifted to encourage soldiers to sign up for the draft, to boldly fight in the war. In fact, the lyrics to 'I Didn't Raise My Boy to Be A Soldier' were parodied, and changed to things like 'I Didn't Raise My Boy to Be a Coward' and 'I Didn't Raise my Boy to Be a Soldier, But I'll Send My Girl to be a Nurse'. The sheet music covers became more patriotic, often looking like the war posters. As the troops prepared to fight, they were buoyed by thoughts of women at home knitting for them, assured that things would return to normal when they returned home, and encouraged that time spent in the war effort was fun. Women were encouraged to knit for the troops, and to do their part on the homefront. Interestingly enough, women were being encouraged to do their part at home, both in taking over the men's jobs, and in knitting for the soldiers, yet they were also being told via songs that when the men returned that things would go back to normal; that they would go back to the home, and the men would take over their jobs again. Some of these sentiments were due to the suffragist movement and the foothold it was gaining, and part was to help the soldiers feel like things would be as expected when they returned from war. As we all know, things didn't exactly return to normal as the men returned from war. Women gained the right to vote in 1919, and from that time on have been increasingly involved in the work force. Mrs. Wilson's Knitting Circle will be held at Liberty Memorial on the first Saturday of each month in 2015, with the exception of those that have a holiday that weekend. So, the next session will be May 2, 2015, at 10:30 AM. Admission is free, though they do ask that you RSVP. With your admission, you will get a period related knitting (and crochet if they are able to find one) pattern, and a very informative history presentation. I was very impressed, not only with what I learned, but with the number of knitters that attended. I didn't count, but the presenters mentioned that they allowed 85 people to RSVP and the event was full. They had to bring in more chairs, so I think that means that more than 85 knitters attended. I was really surprised that I didn't even recognize half of them, and I thought I would know a fair number. 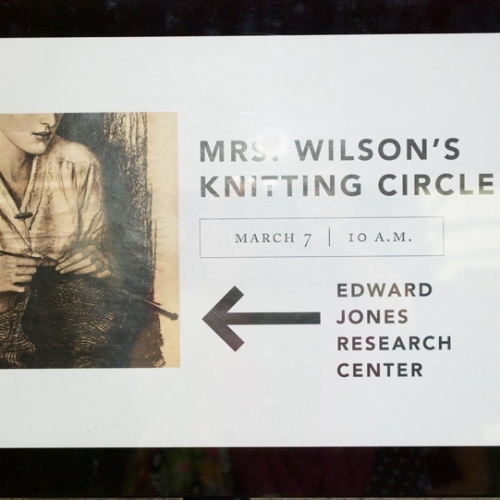 If you are anywhere near Kansas City, Mrs. Wilson's Knitting Circle is something you should attend. If you need to drive in, make a day of it, check out the museum, meet a friend for lunch, and learn a little about knitting during World War I. You are encouraged to bring your knitting, and I certainly made some sleeve progress while there. I really didn't intend to have a silent week here, and I truly don't know exactly what happened. I guess a lot of little things left me with little energy to write. That and there was a secret behind the scenes submission that I was working. I suppose I'll start with the design submission. I submitted a new design to Knitty for their First Fall 2015 edition, and I am really excited about the possibility of being published there. Knitty loves to surprise their readers when the issue goes live, so the details of the submission must be kept quiet until I hear their answer, or the issue is published. I can tell you that a couple of the girls (Beka and Melissa) from my knitting group helped me with the photos, Kelsey knit a great second sample as a test knit, and we shot the photos with some great beer at Kansas City Bier Company. After this, I think that all of the photoshoots I do from now on will have beer, wine or other beverage involved. I tend to feel pressure about the photography on my patterns, and the bit of alcohol loosened things up, made it fun, and resulted in some fun photos. This next project has been in my head for quite a while now, but I couldn't quite get settled on a stitch pattern. This week, I worked a nice large swatch in brioche stitch, bordered by garter stitch, and I really like the fabric, the colors, and the balance of the design. The yarn is Cherry Tree Hill Yarn's Broad Band, a silk and superwash merino blend that presents several colors in about 50 yard stripes. My swatch is in their Indian Summer color way, but when I make the full size shawl, it will be in the skeins at the left of the photo, which are the African Grey color way. I really like the idea of this yarn for doing a color block project like this one, even though it was designed with striping projects in mind. I could certainly go and choose 4-5 skeins of yarn and do the same thing, but here, the dyer has put together the colors in a perfectly matched combination, so I can just choose a color way that pleases me, and begin the project. I don't have to worry about color theory, or not finding just the right color, I can just get started. Over the course of the week, I finished the back of my first sweater design, seamed the shoulders and picked up worked the ribbing at the neckline. I am really happy with the way that the design process is working out. The yarn couldn't be more beautiful, soft, and show the cables any better. It is Anzula Cricket in Navy, and I will definitely be adding more of this to my stash. My vision to continue all the cables around the neck shaping to the shoulders has resulted in a really flattering look, where a vertical line slims the waist, and accentuates the bust. Yesterday, I went ahead and did the math for the sleeves, and cast on for both of them. I am working them two at a time, and since they are going to be in reverse stockinette stitch, I decided to work them inside out. I am able to knit faster than I can purl, so, I think they will zoom right along. When I begin the sleeve cap shaping, I will turn them right side out, and work flat, with the reverse stockinette side facing. This sweater is really close to being finished. I am growing weary of winter weather, but I'd really like a chance to wear this at least once before I put it away for fall. What have you worked on this week? 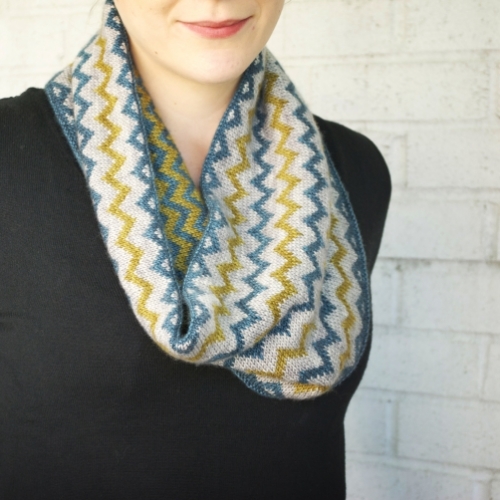 Have you used a striping yarn for a project other than striped projects? 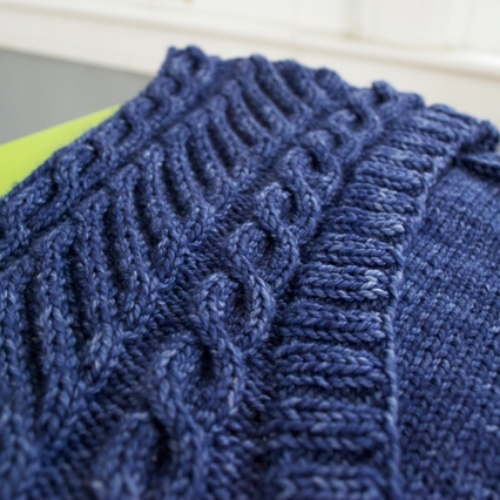 This week in my Year of Making, I worked on a few projects, including a new salad recipe, a bit of spinning, Gansey sweater planning and knitting on the v-neck sweater from last week. I also did plenty of un-pictured cooking which may become recipe posts later on, but I am still working out a few issues with measurements and photography. I suppose we'll start with the salad. We were invited to a friends home for dinner with their family, and we were asked to bring a salad to go along with chicken enchiladas. I couldn't really think of anything to go along with that, except for a nice fresh salsa, so I went with it, and topped my favorite greens with a mango salsa. I had a bit of the salad for lunch today, and it is just perfect to go along with nice warm enchiladas on a cold winter day. I could also see it being a perfect pairing with a grilled steak this summer. There is a recipe forthcoming, so keep your eyes open for more details soon. Next up, a progress report on the navy blue v-neck sweater. I finished both front panels, and I started to work on the back. I am just a couple of inches from the back neck shaping , and then I can seam the shoulders and have a proper try-on session. From the try-ons I've done along the way, it is turning out just as planned. I am deliberately slowing down on this project because I am pretty sure that I am short on yarn. I bought this yarn a year or two ago with a color work blanket in mind, and then decided that yarn this beautiful needed to become a great sweater, so I've requested another skein from the folks at Anzula, and I am waiting for it to arrive. I want to be sure to save at least one skein from the current dye lot so that I can blend the old with the new. I brought out my spinning wheel this week and finished spinning the singles and plied this yarn. It is about 140 grams of what I would say is a DK weight alpaca/bamboo blend that I bought from a Missouri farmer at the MOPACA show back in 2013. I started spinning this nearly two years ago, on the day I bought it. It was put up in 2oz batches, and the first 2 ounces went quickly. Then I put the wheel away for a while, and got it back out last year. I managed to get another 3 ounces or so spun. I was originally thinking I would make a two ply yarn, so I divided the fiber in half and spun it on two bobbins. With less than 2 ounces to go, I put the wheel away again. If you click the MOPACA link above, you'll see that the alpacas are going to be in Kansas City in late March. I have a trip planned, and yarn buying plans. I thought about it, and decided that I needed to finish the purchase from two years ago before I could add to my stash, in any way. So, the wheel came back out, and I spun the last bit into singles. I then decided to navajo ply the singles into a nice 3 ply. One small amount broke off in the plying process, and I really didn't know how to handle that, so I deemed that bit the "swatching skein" and wound it into a ball. I really thought that I wanted this to be a worsted weight, so I knit a nice big swatch on size 9 (5.5 mm) needles, just like the pattern I wanted to make called for. With alpaca, I think there are two ways to knit it: nice and loose so that when it loses its memory and gets drapey, it isn't a surprise, or nice and tight to try to counteract some of that stretchy, drape. I was thinking that this would be okay knit loosely, but after blocking, it really didn't bloom enough to fill in the fabric. I sort of thought this might be the case, so I saved a little of the swatching yarn, and knit up a tiny swatch on size 5 (3.75 mm) needles. I think this is much better actually, but I don't really have a pattern in mind for this gauge. Actually, I haven't measured gauge on either swatch (I think the large needle fabric is about 4 sts to the inch, and the smaller is about 5 sts to the inch. ), but I am having trouble deciding what to make. A hat would have too much left over, but I am not sure I have quite enough for a nice pair of mittens. I suppose I'll keep thinking on it, since the rule was that this wool needed to be something before I could buy more, and it is something: yarn. 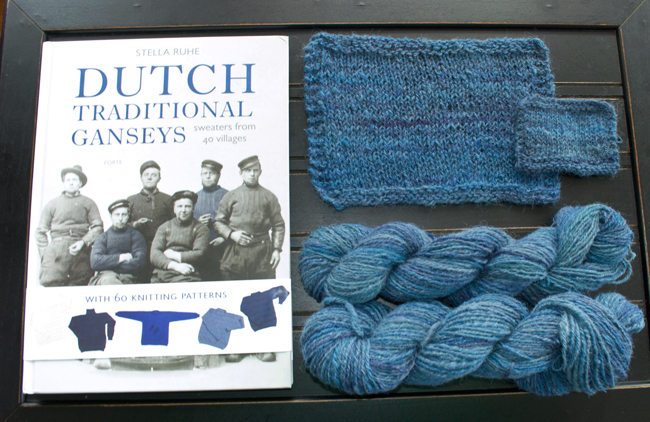 In the mail this week, I received a copy of Dutch Traditional Ganseys, that I had ordered from Schoolhouse Press. In my plans for fall sweater releases, I wanted to find a way to incorporate a Gansey sweater, but I was having trouble figuring out how to make the look flattering for a woman with some curves. The typical design includes patterned stitches that cover the upper chest, but stop at about the point where a woman's bust ends, plus a high crew neck, neither of which I find all that flattering to my curves. So, with this book I have discovered that the Dutch knitters took the typical Gansey construction and modified it according to their thoughts about fit, style, and preferences. I am still thinking of ways that I can work with this traditional shape and make it work with my vision. I am really enjoying this book, reading through the history, and making notes about the stitch patterns. That said, the 60 patterns advertised on the cover would be challenging for inexperienced knitters to achieve, since the style they are written in is not very beginner friendly. Experienced sweater knitters, devotees of Elizabeth Zimmerman, and those that are used to modifying patterns would be able to work the patterns easily, and probably would think it was a lot of fun, but this is not a collection of patterns for newer sweater knitters. The book is loaded with historical information about Dutch fishermen and their culture, including their sweaters, has stitch patterns galore, and detailed information about the yarn used in the traditional sweaters. I definitely am glad to have it in my collection, and certainly would recommend that you take a look at it, if you are interested in working on your own gansey. What have you been working on this week? Do you have ideas for my handspun yarn? This blanket holds a special place in my heart: it went to school with my son in his preschool years, it is the blanket that we reach for when he isn't feeling well, it travels with us on road trips, and gets tossed down at the park for a picnic. I love it because the design is simple, the yarn is easily washable, and the colors are cheery. I consider this blanket to be the one that a mom or friend knits for a new baby; a blanket that gets used, that is easy to care for, and that will stand up to the use of a toddler. There are a couple of design choices that I often receive questions about: a finished edging, and whether or not the blanket is a full mitered square or not. 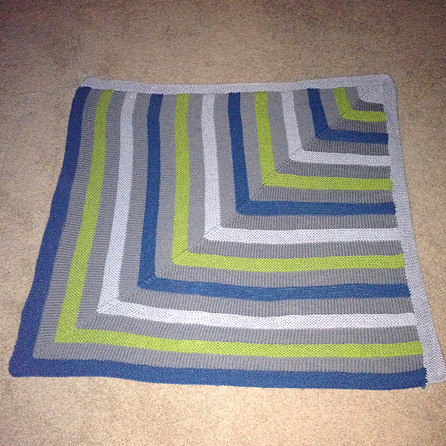 As you can see below, there is not a garter border around the edge of the blanket, and it has a single mitered angle. This was a decision that I made to keep the pattern very attainable for beginning knitters, and I think it preserves a very modern look to the stripes. The stockinette portions at the edges curl in a tiny bit, but the garter stitch stripes keep the blanket from really rolling at the edge. The single mitered corner forms a square, while having 'L' stripes. The only key to this is that your stitch and row gauge need to be the same (or close, since garter stitch can stretch a bit with blocking). The projects that come from this design have really impressed me. Sharon, Rachel and Jessica (a mother/daughter/sister team) worked on this blanket from wool produced by their sheep. They passed it back and forth at each stripe, and they lined the back with some fleece fabric and quilted it using a Tied Quilting technique. I love that idea, and I really think their color choices are fun. Photo Copyright JessicaM; used with permission. Sallie created a beautiful version in blue, green, yellow and white. In her notes, Sallie mentions that the worst part of the project are the ends, and I would have to agree. Typically in striping projects, at least some of the colors can be carried up the side, but with this design the stripes are really too wide for that. I tried to be disciplined and weave in the ends at the end of each pattern repeat, and that really helped. As the rows became shorter though, momentum pushed me forward, and I left the last couple of repeats with their ends hanging until the end. If you have saved your ends until the end, I recommend taking it along to knit night, and tackling them there. Somehow talking distracts me from the tedium. I'm not sure about Sally's strategy for handling the ends, but she did a beautiful job with her blanket. Photo Copyright SalliesJeans; used with permission. Jennie made a blanket in all of my favorite colors, and then modified the pattern to add a finished edge to the two unfinished sides by picking up along the edges and knitting 5 garter ridges in one of her contrast colors. I really like the way it turned out. If you are up for picking up stitches, it adds a lovely finished edge to the blanket, and probably helps it stay in a nice square shape. If this is a modification you want to make, pick up and knit into the edge, placing a marker at the midpoint. Your number of stitches should be about the same as the number of stitches you cast on in the beginning. Decrease at the corner, as you did for the blanket body. For the nicest finished edge (a tip I picked up from Elizabeth Zimmerman), bind off in purl on the right side. Photo Copyright Fooshknitstoo; used with permission. Finally, I'd like to cover an amazing modification of the pattern. Actually, this should probably be its own pattern, because really, the Playful Stripes pattern just won't get you this blanket. Trust me, if you read through Peggy's notes, and think you could do it, then you really don't need to buy this pattern. Peggy's granddaughter saw the Playful Stripes blanket and requested a blanket similar in color, so Peggy went to work, using the pattern as color, texture, and stripe inspiration. Her blanket is absolutely beautiful, way larger than I would have been able to finish, and it sounds like it is well loved. Isn't it amazing! Photo Copyright Peggy; used with permission. Clicking on any of the project photos above will take you to the project page on Ravelry where you can find more information about these projects. For more information about the pattern, please follow this link: Playful Stripes. Do you have questions about this design that I didn't answer? Is there another pattern that you would like to see featured next week? Please leave a comment and I will answer your question, or adjust my plans to get your pick covered next. The school district made this a five day weekend, and Ethan has been hanging out with me since about 3:00 Wednesday afternoon. For a couple of years now, he has been dodging the camera nearly every time I try to take his picture, so most pictures look like he is on the run. I start a blog and want to take a few nice photos, and he is suddenly interested in being photographed again. He goes back to school tomorrow, but until then, my brain power is sort of divided, and my camera is put away.. This week in my Year of Making included finally blocking my Millisande, working on a new sweater design, and baking a Lemon, Almond, Ricotta cake and a pan of Cream Cheese Brownies. Since you are likely here for the knitting, I'll start there. My Millisande is worked in Anzula Oasis, and I really couldn't be happier with it. I was slightly off on the gauge, made some changes to the neckline depth, and wound up with a sweater that I love to wear. I think this yarn combines two great fibers (silk and camel) in a beautiful blend that takes dye in an interesting way, is comfortably warm, without being too warm, and I really like the cables and seed stitch in this yarn. I am hoping for a few modeled photos, and will post them as soon as I have something worth sharing. The unnamed for now sweater design is also worked in a yarn from Anzula: their Cricket, a DK weight Merino, cashmere, nylon blend. This is my first sweater design, and I challenged myself to sketch, swatch, and then at least start to write out the pattern before I cast on. I have written the pattern to the neckline shaping, and I am hoping to have a finished draft pattern by the time I have a finished sample. Then it will be off to the tech editor, and out to testers for a Fall release. I've managed to nearly complete the neckline shaping and started to shape the armhole, so I have some pattern writing catch up to do, but that will wait until Ethan returns to school and the house is quiet again. Moving right along to the baking! The Lemon Almond Ricotta Cake is one I make for breakfast. We try to keep to a gluten free diet, at least at home, and this cake is one of the better, not too sweet options that I have discovered for an on the run breakfast. (None of us have Celiac's disease, so please don't assume that all recipes I link to are safe.) Somehow the protein in the cake keeps me full for a while, much longer than other sugar-y pastries would. I make the cake pretty much as it states in the recipe, except this time I had five Meyer lemons that were looking a little sad, so I zested them all, and put it in the batter. I also decided to use my springform pan to allow the cake to rise a little higher, and added about 1/2 teaspoon of baking powder to help that along a bit. Finally, the Cream Cheese Brownies that Ethan and I made on Saturday. Sometimes I like the noise of the television when I am working around the house, so when Ethan is home, the Food Network is always a safe option. Ethan tends to be a worrier, so I make sure that news, or dramas with intense topics are never on when his ears could be listening. Well, he was inspired by the Kids Baking Championship, and asked if he could learn to bake. I am always open to him being in the kitchen learning with me, so we decided to make his dad's favorite dessert, in honor of Valentine's Day. Ethan had a little lesson in measuring ingredients, fractions, and the art of the double boiler. His level of interest wained a bit before they were in the oven, but it rose again when they were cooled and ready to eat. I had never made brownies from scratch before, and these turned out really nice. That pretty much wraps up last week around here. The plans are a little fuzzy for this week, but there will be more making, I am certain. I suppose that mid-February is as good a time as any to get a start on one of my 2015 goals: to start a knitting design related blog. So, here you have it: the start of StackedWoolens.com. I've never blogged before, but I always feel like I have more to say about my designs than can reasonably fit on the pattern pages or in the Ravelry notes, so that information will be presented here, for those who want to learn a little more about each design before casting on. I'll also have an opportunity to share design schematics, extra sizing information, and yarn notes for new patterns. Speaking of new patterns and goals for 2015, I think sharing those would give a little information about where this blog is going and what you can expect to find here. I've decided that 2015 is a year of making for me. I was inspired by Miriam Felton in 2014, and decided to embark on my own journey. Part of my making for the year includes designing my first collection of sweaters, designed with the curvier woman in mind (more on this as we go). I also feel like this Year of Making is a great opportunity to strive for a healthier version of myself, and to focus on making do, mending, repairing, and spending less time thinking about what I want to buy next. So, with that said, until I have new information to share about the previously mentioned sweater designs, I will be doing a weekly wrap up in my Year of Making journey each week; I will also be going back to previously released patterns and featuring them here, answering some of the frequently asked questions, sharing additional photos, and highlighting amazing knitter projects. If you have found this page, please know that as you poke around the site, that it is still under construction. I will be updating the pages with knitting related photos and more information in the next couple of days.